Let's Sew 12 Days Of Christmas [G1523] - $6.00 : Yarn Tree, Your wholesale source for cross stitch supplies. Cross stitch chart from Imaginating. Designed by Ursula Michael. Are you ready for Christmas? This french hen is! 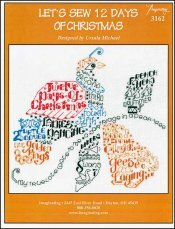 This french hen is made up of the verses from the 12 days of Christmas. "2 turtle doves," "ladies dancing," etc. are a few of the verses stitched. Two doves, a swan, a drum, french hens, etc. are also stitched among the words. Stitch count 138h x 134v. Stitched on #2936 Zweigart Aida 14ct. White.